Reviews for Redfin, a multi-state real estate broker and an agent referral network that offers consumers listing savings and buyer’s refunds. A multi-state broker, a full-service company rebates buyer part of the commission it receives, where allowed, and provides listing savings to sellers. In some cases, this company acts as an Internet referral fee network where it is unable to provide real estate services. Offers consumers listing savings to sellers (1% to 1.5% listing fee) and buyers where allowed by State law (21% rebate approximate.). Redfin works with about 3,100 Partner Agents in regions where it has no direct representation in exchange for a 30% referral fees. Redfin is one of the largest real estate agents in the United States that offers service of a traditional agent with a competitive commission. It is important to separate Redfin services into three distinct categories: a real estate agent, a referral network and a direct cash buyer. This review is focused on its operations as a real estate agent and a referral network. RedfinNow is further segregated into its own category because it operates as an investor and not a professional agent service model built to represent consumers. Redfin went public in 2017 with an IPO that has raised $138 million and have thus saved consumers millions in commissions over typical rates offered by traditional real estate brokers. However, Redfin’s operations as a referral network result in an inefficiency known as reverse competition and possible price fixing. Such practice may result in lower quality of service and higher commissions due to added fees. Redfin Agents are salaried employees who are also paid bonuses based on client feedback and are not motivated by commissions. Redfin Agent Listing includes posting home on the MLS and MLS Aggregator services, professional photos, 3D tour and all typical services offered by a traditional real estate agent. Redfin gives sellers access to a well-designed dashboard to track buyers viewing your home and other communication features. Where Redfin cannot directly serve consumers, the company relies on a referral network of approximately 3,100 independent agents at other brokerages. Approximately 40% of all real estate transactions originated by Redfin are executed by this referral network. Referral agents pay 30% of their commission back to Redfin when they close a transaction. Once Redfin refers a customer to a Partner Agent, that agent, not Redfin, represents the customer from the initial meeting through closing. In the past, Redfin had actively dictated that Partner Agent commission listing rates are set at 1.5%, or that Partner Agents issue rebates set at 15% to buyers (15% went to Redfin as a kickback.) Redfin has since revised this policy because it violates antitrust law. In the United States, all independent brokerage fees are always negotiable and each real estate agent establishes its own policy for a fee structure, amount of commissions, and the sharing of any listing commissions. Price fixing is prohibited by antitrust legislation. To fix, control, recommend, suggest or maintain commission rates or fees for other agents' services is an improper practice. Redfin Corporation has recently stopped such blatant price fixing strategy, where a statement on the company’s website now reads: "Since Partner Agents aren't employed by Redfin, we can't guarantee our 1%–1.5% listing fee or offer a Redfin Refund for customers who work with a Partner Agent." This statement means not only that Redfin "can't guarantee" these savings, but also that consumers shouldn't expect to receive savings from a Partner Agent. Redfin still heavily engages in market-allocation and consumer brokering practices in their efforts to earn referral fees, instead of actually providing representation services. In 2019 Redfin has made a massive move by allowing with RE/MAX brokerage to participate as Partner Agents, where consumers are "sold as leads" to RE/MAX brokers for 25% cut of their commission. Consumers a highly likely to overpay for listing commissions and receive little or no refund using Redfin Partner Program, when buying or selling a home, because the added 30% referral fee makes it impossible for Partner Agents to negotiate a fair market rate. By utilizing Partner Agents, consumers are not just getting nothing, but are being subjected to thousands and sometimes tens of thousands in useless fees paid for the privilege of getting connected to a random agent. Redfin Partner Program is one of the worst consumer brokering programs in the market because it implies that consumers will get a lower listing rate, or a refund from the Partner Agent shown on the Redfin website, but due to price fixing antitrust law this is not true. By negotiating with an agent directly, or using HomeOpenly Open Marketplace, consumers are able to receive such savings, because HomeOpenly has a 0% referral fees structure and we are legally able to advertise rates for thousands of independent agents who offer all sorts of independently set savings – refunds, listing rates, or flat fees. In fact, any real estate agent who uses Redfin Partner Program is able to freely advertise their services, refunds and/or listing rates on HomeOpenly and bypass excessive referral fees set by Redfin, saving consumers 30% in referral fees. 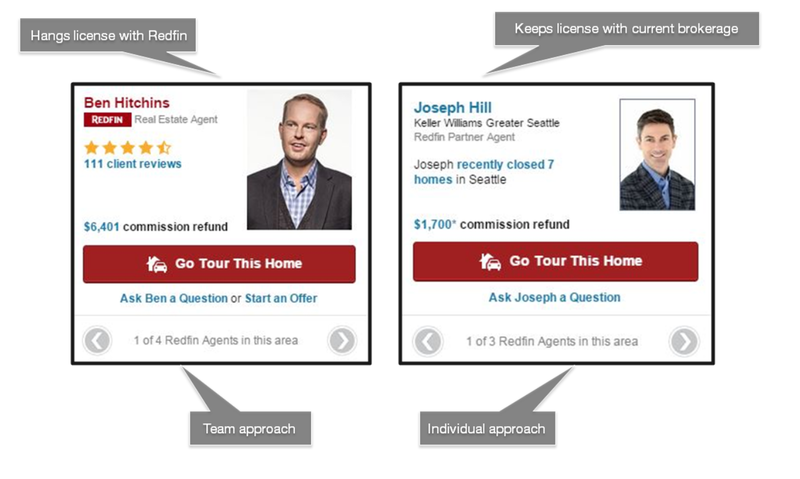 Consumers should absolutely avoid using Redfin Partner Program agents. In November 2017 Redfin has launched a program called Concierge Service in select areas that offer home sellers added benefits of coordinating, supervising and paying for services such as deep cleaning, painting, staging, and landscaping in exchange for a 2% listing fee. Atlanta, Austin, Baltimore, Boston, Chicago, Dallas, Denver, Indianapolis, Las Vegas, Los Angeles, Orange County, Phoenix, Portland, Sacramento, San Diego, San Francisco, Seattle, St. Louis, Richmond, Washington, D.C., Philadelphia, Pittsburgh, Cleveland, and New Jersey. As of 2017, if you list your home for sale with Redfin, they hide your house from potential buyers on competing web sites. For example, if you list a home on Redfin, it will not show up on Zillow. They want to sell your listing only to Redfin visitors, and this will hurt you as a seller.